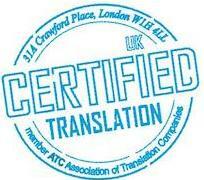 CERTIFIED UK TRANSLATION SERVICES offers certified translation services from and to most languages English French Italian Portuguese Russian Arabic Chinese Slovak Spanish Romanian Japanese German Indonesian Bulgarian Hebrew Latin Latvian Dutch Lithuanian Albanian Urdu Thai Farsi Hungarian Czech Swedish Danish Norwegian, etc, for submission to UK and foreign organisations. CERTIFIED UK TRANSLATION SERVICES was created in the year 2000 for the specific purpose of translating and certifying only. We understand the process required when a document needs to be Translated and Certified or Sworn or Notarised and Legalised for submission to institutions in the UK and abroad.